Description: Individually numbered limited edition 200-gram mono LP! There are a multitude of reasons why Bags' Groove remains a cornerstone of the post-bop genre. Of course, says All Music Guide, there will always be the lure of the urban myth surrounding the Christmas Eve 1954 session -- featuring Thelonious Monk -- which is documented on the two takes of the title track. There are obviously more tangible elements, such as Davis' practically telepathic runs with Sonny Rollins (tenor sax). Or Horace Silver's (piano) uncanny ability to provide a stream of chord progressions that supply a second inconspicuous lead without ever overpowering. Indeed, Davis' choice of former Dizzy Gillespie Orchestra and concurrent Modern Jazz Quartet members Milt Jackson (vibes), Kenny Clarke (drums), and Percy Heath (bass) is obviously well-informed. This combo became synonymous with the ability to tastefully improvise and provide bluesy bop lines in varied settings. The up-tempo and Latin-infused syncopation featured during the opening of "Airegin" flows into lines and minor-chord phrasings that would reappear several years later throughout Davis' Sketches of Spain epic. The fun and slightly maniacally toned "Oleo" features one of Heath's most impressive displays on Bags' Groove. His staccato accompaniment exhibits the effortless nature with which these jazz giants are able to incorporate round after round of solos onto the larger unit. 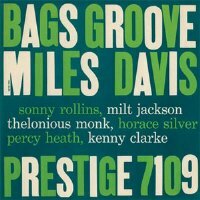 Bags' Groove belongs as a cornerstone of all jazz collections. Recorded June 29 and December 24, 1954 at Van Gelder Studio, New Jersey. Mono. Originally released by Prestige (PRLP 7109). This reissue released in 2014 by Analogue Productions.